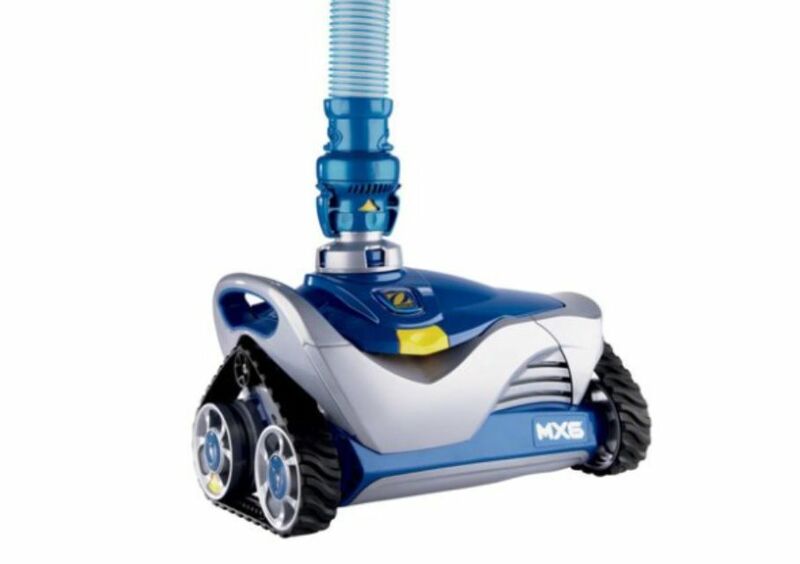 One of the best robotic pool cleaners in terms of price and performance is the Dolphin Nautilus CC Plus. While it’s not cheap, this robotic pool cleaner is worth every penny, as it will scrub every inch of your pool, including the floors and walls! The Dolphin Nautilus CC Plus can clean pools up to 50 feet, and it takes about two hours to do so. You can set a schedule for the robotic cleaner, choosing from frequencies of every day, every two days, or every three days, and it will automatically get to work. It has dual-scrubbing brushes that will remove dirt from the walls and floor of your pool, and it also has two large top-load filters that capture leaves and other debris. This robotic pool cleaner will also save you money, as it’s eight times more energy efficient than suction or pressure cleaners. It has an anti-tangle cable, and reviewers say it’s incredibly efficient and convenient for anyone who’s tired of scrubbing their pool during the summer. Most robotic vacuum cleaners are expensive, thanks to their high-end technology. However, the Zodiac Baracuda Automatic Suction Inground Swimming Pool Cleaner is a good option for those on a budget, as it gets consistently positive reviews and costs less than $300. This device uses suction to clean your pool, so you won’t get the same energy savings as you might with other robotic cleaners. The Zodiac MX6 hooks up to your filter through a series of included hoses, and the brand says it’s best for pools with 2-speed or variable-speed pumps. It will thoroughly clean floors, walls, and the waterline of in-ground swimming pools, and the little machine boasts optimized flow control to ensure optimal performance. According to reviewers, this pool-cleaning robot is ideal for regular pool maintenance, and many say it even does a good job on stairs and in corners. If you’re interested in reading more reviews, take a look at our selection of the best pool cleaners available to purchase online. Smart home devices are the new normal, so it should come as no surprise that there’s a robotic pool cleaner that you can control via smartphone. The Dolphin Oasis Z5i Robotic Pool Cleaner uses Bluetooth technology to sync to your phone, allowing you to spot clean your pool without lifting a finger. This high-end model from Dolphin features a powerful dual-drive motor that can clean pools up to 50 feet in 2.5 hours, and you can set the weekly schedule to your preferred frequency. The dual brushes will remove any dirt and debris from the walls, floor, and waterline of your pool, and the robotic cleaner’s 360-degree pinpoint turning allows it to tackle pools of any shape. Plus, it has oversized cartridge filters that trap leaves and fine debris with ease. Reviewers love that you can simply turn this gadget on and walk away, then come back a few hours later to a sparkling clean pool. Who wouldn’t love that? See more reviews of our favorite smart home devices that you can buy today. Vinyl pool liners are quite popular, but they can develop wrinkles if not installed and maintained properly. Even if your pool has some uneven areas, you can still use the Aquabot Pool Rover Hybrid Robotic Pool Cleaner in it, thanks to the machine’s extra-wide, non-marring wheels. The Aquabot Hybrid can be used in both above-ground and inground pools up to 40 feet long, and it takes about an hour to do its job. While it will remove both big and small debris from your pool, as well as clean the floor with its jet-propelled system, this robotic pool cleaner can’t get up the walls, unfortunately. The debris that’s sucked up gets trapped in a reusable filter bag, so you do have to empty it after each use. Reviewers say the Aquabot Hybrid does a great job sucking up leaves and other debris, but some note it can get stuck in corners when left to its own devices. Is there a tree or plant near your pool that’s always dropping leaves into the water? It’s a common complaint, and no one likes swimming among a sea of dead leaves! If you have a serious leaf problem, you’ll want a robot cleaner like the Dolphin Triton PS Plus, which has an extra-large filter basket that will trap all that annoying debris. The Dolphin Triton PS Plus can clean pools up to 50 feet long, and it will tackle the floor, walls, and waterline in around two hours. However, it also has a “quick” mode that takes just one hour. You can set the robot to clean on a schedule, and its brushes spin twice as fast as standard cleaners, helping to scrub off any and all dirt. Plus, the oversized top-load filter basket can hold more leaves, as well as fine debris that might be floating around. Robotic pool cleaners aren’t just for inground pools. The Aquabot Pool Rover is specially designed to use in above-ground pools up to 30 feet long. It features “NeverStuck” rollers that allow it to easily navigate over bumpy bottoms, and it has non-marring tires that won’t mess up your lining. This pool cleaner operates for about one hour, sucking up both fine dirt and larger debris into its on-board filter bag. It comes with two filter bag options, which you can switch out depending on whether you want to filter big or small particles. Many people say this little pool cleaner picks up an impressive amount of dirt, and it can navigate above-ground pools with ease. In the market for a new pool? Check out our guide to the best above-ground pools you can buy. If you have an inground pool, chances are you want a robotic pool cleaner that will tackle both the floor and the walls. Luckily, the rugged Polaris F9450 Sport is just the robot for the job. This cleaner works on all surfaces, cleaning the floor, walls, and tile liner of pools up to 50 feet with its pleated scrubbing brush. The Polaris Sport captures four times as much debris as other cleaners in its large, easy-empty filter canister, and you can set its programmable timer to your own custom cleaning schedule. It has a built-in sensor that figures out where it is in the pool, adjusting its path to clean more efficiently without tangling the cord. It’s the perfect device to keep your inground pool shiny and clean this summer. Some people prefer to use a pool skimmer to keep their pools clean. These devices are used to capture dust, dirt, bugs, leaves, and other debris from the top of the water, removing gunk before it can sink to the bottom. Luckily, there are several robotic pool skimmers available, the best of which is arguably the Solar Breeze. This solar-powered robotic pool skimmer works all day long, navigating around the top of your pool to remove more than 90 percent of surface debris. It also has a built-in chlorine tray that can hold two 3-inch tablets, allowing it to sanitize the water as it operates. Reviewers call this solar-powered robotic skimmer “awesome,” and many love its spacious debris basket and, of course, the fact that it harnesses the energy of the sun to save you money on electricity. You can also cut down on your energy bills by investing in a solar pool cover, which uses the sun to raise pool temperatures and retain heat.